Northwestern players hoist the Land of Lincoln Trophy, awarded to the winner of the NU-Illinois rivalry game, after beating Illinois 24-14. The Wildcats improved to 10 wins for just the fourth time in program history. CHICAGO — Before Saturday’s game against Illinois, coach Pat Fitzgerald had a simple message for Dan Vitale and Northwestern’s captains. The No. 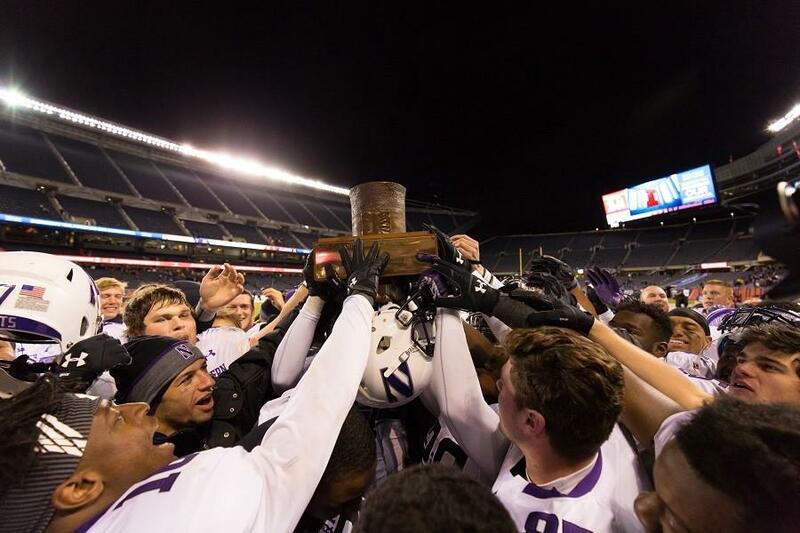 16 Wildcats (10-2, 6-2 Big Ten) defeated the Fighting Illini (5-7, 2-6) 24-14 at Soldier Field on Saturday, earning NU the hat-shaped Land of Lincoln Trophy and the program’s first 10-win regular season since 1995. Saturday’s victory felt like revenge for the Cats, who last year lost to the Fighting Illini 47-33, thus ceding the trophy, which is awarded annually to the winner of the end-of-season game between NU and Illinois. After falling behind 7-0 in the first quarter Saturday, the Cats scored three unanswered touchdowns. Several punt-heavy quarters followed, before the Fighting Illini cut the deficit to one touchdown with an interception return touchdown late in the third. NU responded with a field goal, then held Illinois off the scoreboard, in part thanks to a Fighting Illini missed field goal, to secure another close victory. Jackson was the Cats’ offensive star, racking up 172 yards and a touchdown on 37 carries. The sophomore moved into sixth place on NU’s all-time rushing list on the way to his fourth consecutive game with 100 yards on the ground. As has been the case all season, NU’s defense carried the team, even when the offense stalled. After ceding a touchdown on Illinois’ first drive, the Cats didn’t give up another offensive score. Sophomore linebacker Anthony Walker led the Cats with 14 tackles and a sack, and sophomore safety Godwin Igwebuike and redshirt freshman linebacker Nate Hall added 10 tackles apiece. Saturday closed out a regular season in which NU’s defense ranked seventh nationally in points allowed per game and 11th in the country in yards allowed per game. “This is the best defense I’ve played on in my entire life,” fifth-year senior defensive end Deonte Gibson said. Although NU’s offense was inconsistent Saturday, its early-game scoring flurry proved to be enough. The Cats’ first score resulted from a pair of impressive throws by redshirt freshman quarterback Clayton Thorson: a 48-yard heave to junior receiver Austin Carr and a 19-yard touchdown to Vitale. On the next drive, a costly Illinois penalty and power rushing from Jackson led to a three-yard score by junior running back Warren Long. The Cats quickly regained possession and scored again, this time via a three-yard Jackson carry. Barely three minutes into the second quarter, NU led 21-7. The Cats’ offense struggled for much of the next half hour of gametime, but following Illinois linebacker Mason Monheim’s third-quarter interception return touchdown, the unit, led by Jackson, put together a timely field goal drive. Later in the fourth quarter, Jackson helped run out the clock and send NU into a hat-centered celebration frenzy, with Gibson lifting the trophy as the players sang the fight song with fans. The Cats’ next game will come in late December or early January, in a to-be-determined bowl game. Fitzgerald lobbied hard Saturday for a much-coveted New Year’s Six bowl, citing the team’s September victory over Stanford, but NU will more likely end up in the Outback or Holiday Bowl. Regardless, the postseason appearance will give NU a shot at the first 11-win season in program history.